Configuration note: CPUs and peripheral modules stack above this board with the ADP041 in the bottom position. This PCIe adapter board is a useful tool for developing PCI Express systems based on the PC/104 form factor. 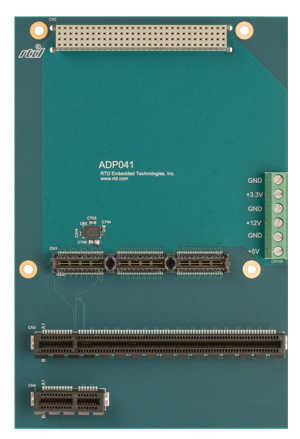 The ADP041 allows users to install PCIe slot boards beside a PCIe/104 or PCI/104-Express stack.